Ricinus communis is an industrially important non-edible oil seed crop, native to tropical and subtropical regions of the world. Although, R. communis genome was assembled in 4X draft by JCVI, and is predicted to contain 31,221 proteins, the function of most of the genes remains to be elucidated. A large amount of information of different aspects of the biology of R. communis is available, but most of the data are scattered one not easily accessible. Therefore a comprehensive resource on Castor, Castor DB, is required to facilitate research on this important plant. CastorDB is a specialized and comprehensive database for the oil seed plant R. communis, integrating information from several diverse resources. CastorDB contains information on gene and protein sequences, gene expression and gene ontology annotation of protein sequences obtained from a variety of repositories, as primary data. In addition, computational analysis was used to predict cellular localization, domains, pathways, protein-protein interactions, sumoylation sites and biochemical properties and has been included as derived data. This database has an intuitive user interface that prompts the user to explore various possible information resources available on a given gene or a protein. CastorDB provides a user friendly comprehensive resource on castor with particular emphasis on its genome, transcriptome, and proteome and on protein domains, pathways, protein localization, presence of sumoylation sites, expression data and protein interacting partners. Ricinus communis (Euphorbiaceae family) is an industrially important non-edible oil seed crop with several well established applications in industry. Castor bean genome is around 350 Mb and was sequenced and assembled in 4X draft by Chan et al. using whole genome shortgun strategy and is predicted to contain 31,221 proteins, although the function of most of these proteins remains unknown. Thus, a comprehensive database has been developed to provide a useful resource by integrating information on genome, transcriptome, and proteome of R. communis. Sequence data of Castor bean plant was obtained from various resources like National Center for Biotechnology Information (NCBI)  and JCVI Castor Bean Genome Database . Appropriate programs were developed to establish a connection with various databases for accessing the information using API. Important information extracted from the analyzed data was compiled in a back-end database using MySQL database server  for the construction of CastorDB. The information incorporated in CastorDB was generated by comparing the information extracted from different resources thus a comprehensive resource has been built for R. communis with information on protein domains, biosynthetic pathways, protein localization, and presence of sumoylation sites, gene expression data, and information on interaction between proteins. CastorDB not only provides researchers an opportunity to extract detailed biological information on any specific gene or protein from a single resource but also prompts the researcher to use the information to explore new information that is becoming available in plant genomics. Sequence information on 31,221 proteins and genes of R. communis was downloaded from JCVI Castor Genome database  on January 12, 2009. Sequences from this database have unique locus identifiers, which were used during the analysis for distinguishing sequences from each other. A large number of sequences obtained were described as either hypothetical or predicted. dbEST  is a division of NCBI that contains EST data and "single-pass" cDNA sequences from various organisms. About 60,000 ESTs from different tissues of R. communis were obtained from dbEST. Each EST sequence was mapped on genes by performing nucleotide BLAST  against mRNA sequences from R. communis with e-value cutoff 10-6. R. communis proteins were mapped with gene ontology information on the basis of GO annotation available for Pfam domains from Gene Ontology database [7, 8]. The mapping of GO annotation to Pfam Domain was generated from data available from InterPro database for InterPro2GO mapping . 11847 proteins were mapped with probable GO annotation in R. communis. Prediction of the R. communis proteins localization was generated using the Wolf-PSORT , SignalP [11, 12] and TMHMM [13, 14] programs. WoLF-PSORT, which is a major extension to the PSORTII  program, predicts subcellular localization of proteins based on known sorting signal motifs and their amino acid sequences. SignalP 3.0 server predicts the presence and location of signal peptide cleavage sites in amino acid sequences from different organisms based on artificial neural networks and Hidden Markov Models. Integral membrane proteins in Castor bean genome were predicted by using TMHMM, which uses Hidden Markov Model to discriminate between soluble and membrane proteins. Frequency of proteins predicted at different cellular localization is shown in Figure 1. Statistics of protein predicted at different cellular localization in Ricinus communis. Pfam  database was used to predict domain present in R. communis protein sequences. 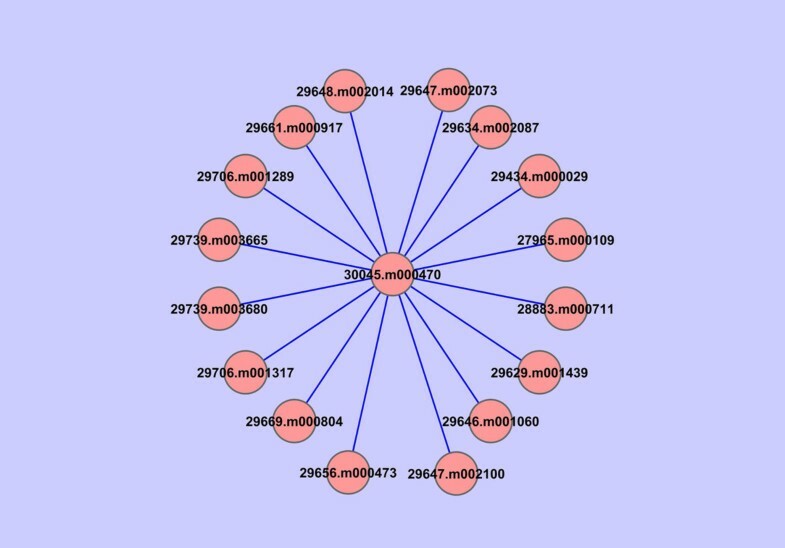 Pfam, a large collection of multiple sequence alignments and Hidden Markov Models covering many common protein domains and families, has two parts; Pfam-A (a curated database with 9318 protein families) and Pfam-B, which contain large number of small families taken from PRODOM database  that do not overlap with Pfam-A. All R. communis protein sequences were scanned for probable domains using pfam_scan program with an E-value cut-off of 10-3. A total of 3546 domains were found for 18445 protein sequences, information for which is incorporated in CastorDB. Top 10 high frequency domains are shown in Figure 2. Statistics of 10 high frequency domains predicted in Ricinus communis. Putative pathways for the R. communis protein sequences were predicted by using KEGG Pathway database . KEGG PATHWAY is a collection of manually drawn pathway maps representing knowledge on the molecular interaction and reaction networks and incorporating information for approximately 146,590 pathway maps from different species belonging to 407 reference pathways. R. communis proteins (31,221) were compared to the Swiss-Prot database [19, 20] using BlastP  API from DDBJ  with an E-value cut-off of 10-6. Each query protein sequence from R. communis was assigned probable pathways based on pathway information available from KEGG database for their homologous protein sequences in other species. A total of 112 probable pathways were predicted for 3785 Castor bean proteins. All predicted pathways were manually checked to remove false positives from the prediction result. Probable protein-protein interactions in R. communis were predicted using interaction information protein interaction for Arabidopsis thaliana from A rabidopsis t haliana P rotein I nteractome D atabase (AtPID) . The AtPID represents a centralized platform to depict and integrate the information pertaining to protein-protein interaction networks, domain architecture, ortholog information and GO annotation in the Arabidopsis thaliana proteome. The Protein-protein interaction pairs in AtPID are predicted by integrating several methods with the Naive Baysian Classifier. Proteins from R. communis were BLAST against the Arabidopsis thaliana protein sequences obtained from The Arabidopsis Information Resource (TAIR)  and vice versa using E-value cutoff 10-6. The R. communis proteins which were predicted to show similar domain architecture (i.e. same domains) to that of homologue proteins from A. thaliana were only selected for further predicting probable interacting protein pairs. A total of 33,000 interacting protein pairs were predicted during the analysis. Schematic diagram showing prediction of protein-protein interaction in R. communis is shown in Figure 3. 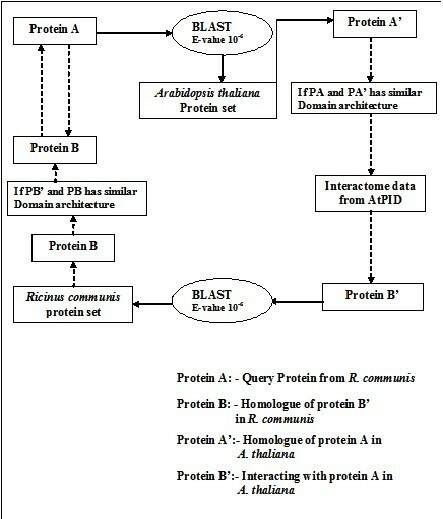 Schematic representation showing algorithm for predicting protein-protein interaction in Ricinus communis. Putative sumoylation sites in Ricinus communis proteins were predicted using SUMOsp 2.0  software for sumoylation site prediction by the Cuckoo work group. The non-redundant training data in software contained 279 sumoylation sites from 166 distinct proteins. SUMOsp 2.0 predicted sumoylation sites for 9755 protein sequences in R. communis at a high cut-off value. Biochemical properties of the protein sequences were calculated using Pepstats program from European Molecular Biology Open Software Suite (EMBOSS) package . Pepstats was programmatically linked and used to predict biochemical properties of R. communis proteins. Pepstats calculated molecular weight, isoelectric point, charge, size of protein, extinction coefficient and average residue weight for all the proteins in R. communis. In order to find the best homologue for R. communis protein sequence in NCBI  and KEGG , protein BLAST  was performed at e-value cutoff 10-10 against protein sequence dataset obtained from NCBI and KEGG using keyword Ricinus communis. The hit with maximum identity and lowest e-value was selected as best homologue. Schematic representation of architecture of CastorDB showing different input options. T1, T2 and T3 represent the members of Tier1, Tier 2 and Tier 3. Graphical interface provides the user access to CastorDB using various input queries and provide links to additional information pages which guide the user during browsing of CastorDB. The query inputs from user interface are sent to program and scripts in layer T2 via post method. T2 consists of Apache web server  for Windows platform and scripts written using Perl CGI . Perl CGI scripts use bioperl modules to support use of local BLAST  obtained from NCBI ftp site and parse result to represent the necessary information on browser. CGI scripts also use MySQL Perl API to connect to the MySQL database  in tier T3. Perl DBI module along with DataBase Driver (DBD) for different type of server provides a generic interface for database access. Complex queries that analyze a large variety of different types of data can, therefore, be realized in a fairly intuitive manner. The Relational Database Management System MySQL  was used to store data integrated in CastorDB. MySQL run as a server and provides multiple-user access to number of different databases. The database schema had been implemented using MySQL Perl API, an Application Programming Interface (API), for accessing data in a heterogeneous environment of relational and non-relational database management systems in Perl programming language. CastorDB provides access to explore the stored information by three different kinds of search methods: (i) Simple Search (ii) Advanced Search (iii) BLAST Search using protein or nucleotide sequence. This feature of CastorDB allows user to browse database by inputting keyword for selected query option. There are seven query options (Figure 5) which accept specific input for retrieval of corresponding information from the database. 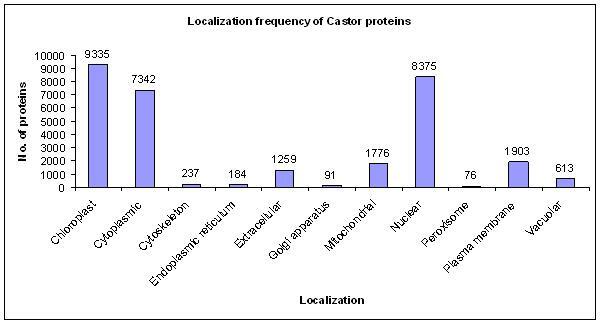 Each gene/protein record in Castor DB is assigned a unique nine letter accession code termed as CastorID which begin with keyword "RC" and is followed by seven digit number (RC00#####). This ID differentiates each entry in the database from one another. 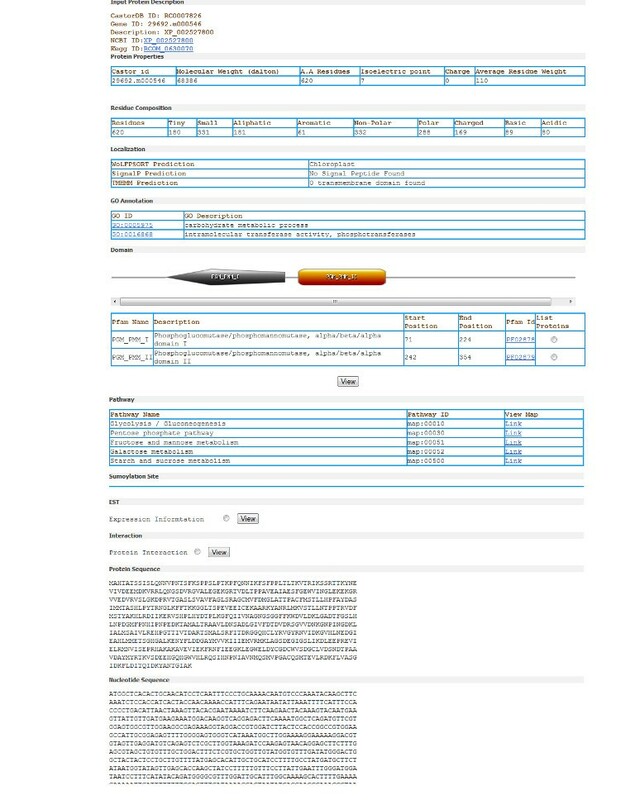 Screenshot of the web interface for simple search of CastorDB using different query options. This mode of searching CastorDB allows user to combine multiple queries with one another. Database can be searched in multiple dimensions looking for records which satisfy the given conditions for all combined queries. For example: Query can be generated to search for genes having at EST's from leaves, involved in glycolysis pathway and localized in chloroplast of cell. Similarly many other queries can be generated using available options (Figure 6). Screenshot of the advance search interface of CastorDB, combining different query options. 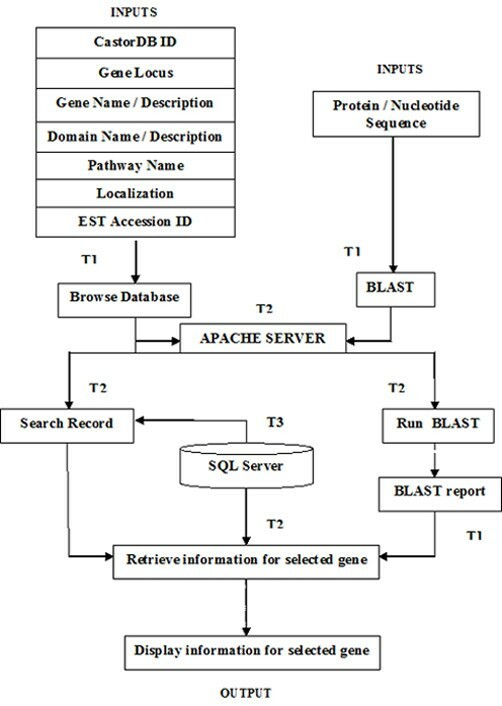 BLAST [6, 21] based search allows user to browse CastorDB using sequence in FASTA format. The option allows search against protein and nucleotide sequence database of R. communis generated using formatdb from standalone BLAST package. The result table generated after running the program display BLAST hits sorted according to percent identity in descending order. Information section for selected gene provides information about Domains along with image generated using Domain Image Generator program from Prosite , Pathways, Localization, Sumoylation site, EST expression, Protein-Protein interactions, biochemical properties and closest NCBI homologue (Figure 7). The graphical interaction network for selected protein can be visualized using Cytoscape software . The link is provided to download "jnlp" file for each protein which run Cytoscape program using java web start (Figure 8). Screenshot of the result page showing different information incorporated in CastorDB. Protein-protein interaction network visualized using Cytoscape. This feature allows user to download information in form of text file for all gene appearing in search result using multiple export option or by selecting each gene individually. Other web interfaces includes "Help" section which provides description of each query option and accepted keyword input in CastorDB. "Literature and Links" section provides links to external literature databases such as Pubmed and Agricol; and links to web resources used during analysis of castor genome. "Feedback" section allows user to comment on data and utilities incorporated in CastorDB. The queries provided by CastorDB are focused on retrieving available information from various databases along with queried information for a particular gene or protein in R. communis. Currently, information about this important oil seed plant is available in different sources. Among the existing databases, (i) JCVI Castor Genome Database and NCBI provides sequence information on R. communis genes and proteins; (ii) Information on EST expressed during different condition is available from dbEST division of NCBI database. 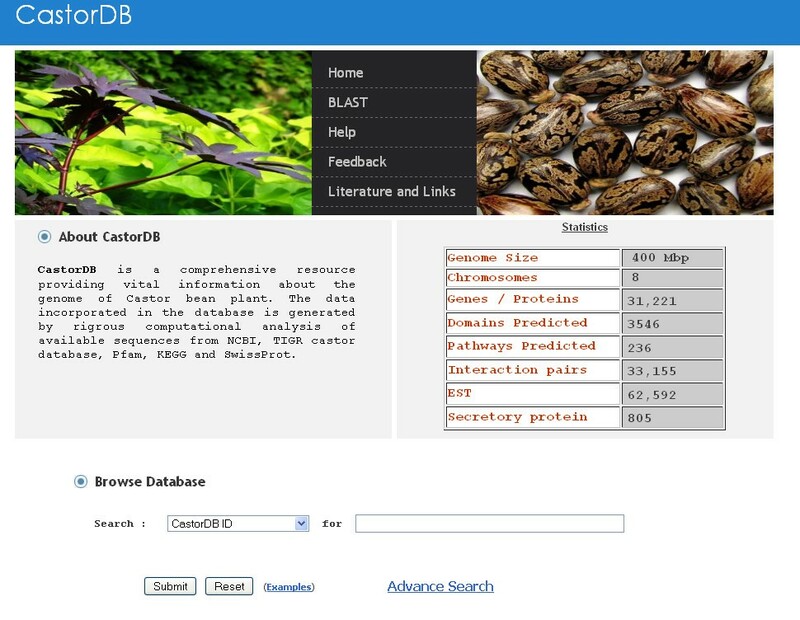 CastorDB is, designed to facilitate the analysis of information on R. communis obtained from various resources and develop a comprehensive database. CastorDB database provides researchers information not only on gene and protein sequences but also on possible Go annotation, domains present in a protein, predicted pathways, probable interacting partners, sub-cellular localization, protein sumoylation sites, gene expression and even biochemical properties of a given protein. In addition to a common BLAST search, CastorDB provides the user with a scope for keyword search using the options like CastorDB ID, locus tag, gene name, domain name, pathway, localization, EST accession number. Also, some of the experimental data obtained from external resources are represented in more interpretable form which can provide researchers with a better understanding about the plant and help in designing critical experiments to gain deep insights into its biology. In order to incorporate newer findings the database will be updated in every 6 months. CastorDB was generated by correlating the information available on its genome, transcriptome, and proteome and a comprehensive resource was built on protein domains, pathways, protein localization, presence of sumoylation sites, expression data, protein interacting partners, etc. In addition to a common BLAST search and simple keyword search, CastorDB provides the user with a scope of doing advanced search by using different keywords and options. Also, some of the experimental data obtained from external resources are represented in more interpretable form. 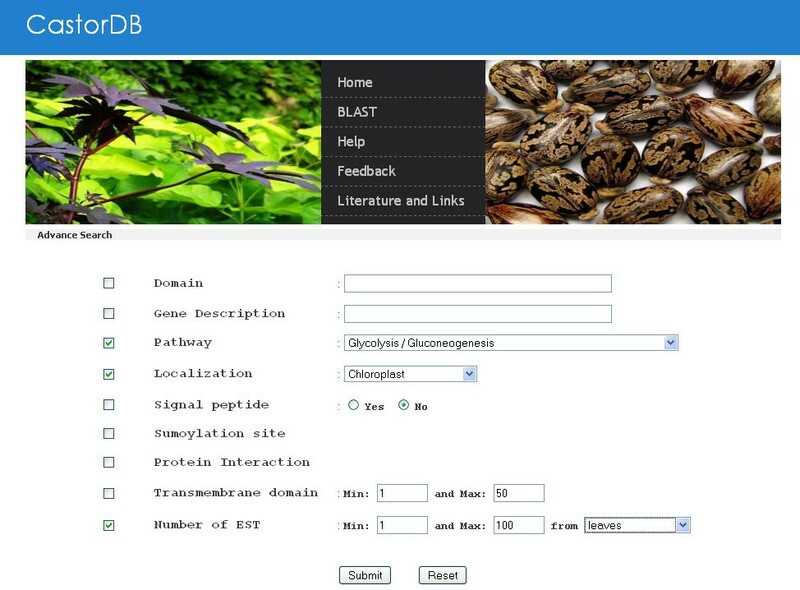 Thus, CastorDB would be an important database providing researchers with information to better understand the biology of this important plant. This work was supported by grants from Department of Biotechnology (DBT), Ministry of Science and Technology, Govt. of India. ST developed programs, scripts, tools for the database, carried out data analysis and drafted the manuscript; SJ helped in conceiving and designing the web server idea, analyzing the data wrote the manuscript; BBC provided critical inputs to develop the database, and to write the manuscript. All authors have read and approved the final manuscript.